Are you looking for a stylish and functional table lamp for your office or home? Seealle grace wood table lamp will be perfect for you! With USB charging outlet and convenient pull chain, it will be an amazing idea to get one for your home! Just plug it in and enjoy the lighting! 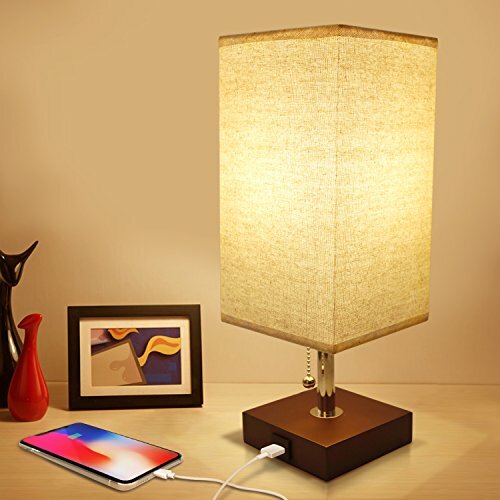 With the USB charging port on the wooden base, this side table lamp is so convenient to charge your phone or other device while you sleep or work. The stylish pull chain makes the bedside desk lamp so easy to turn the light on or off without leaving your bed to find the switch on the cord. It's the great bedside and working companion. The modern end table lamp has a natural linen lamp shape, gives off the relaxing feeling to you and romantic glow when you spending the time with your family.Ideal lighting for bedroom, living room, coffee table, office, dinning table etc. 1.When receiving the bedside table lamp, please screw off the ring on the bulb base firstly. Put the lampshade on it and screw on the ring to fit the threads. 2.Please turn on the rocker switch on the cord when you want the USB port and pull chain work. If you turn off the rocker switch, then the pull chain and USB port will not work. 1.This wood desk lamp features E26 screw base (Max 60W). The bulb is not included. 2.Please keep the wooden base of the nightstand lamp away from water. Funtinal Table Lamp--Be tried of getting up to find a socket to charge your phone when you lay on the bed? Get Seealle USB bedside table lamp will be a smart choice,the base of this table lamp contains a USB charging port, convient to charge your mobile phones, tablets, kindle readers, laptops, and other electronic devices. Stylish & Convenient--You can just turn off the wood desk lamp with the stylish pull chain instead of getting up to flip a switch. Convenient choice for your bedside table and nightstand. Safe for your home-- The cord, socket,plug,usb port of this bedside lamp have UL certificate. Safe choice for your family. If you have any questions about this product by Seealle, contact us by completing and submitting the form below. If you are looking for a specif part number, please include it with your message.